To replace aging diesel school buses with an alternative fuel that would perform reliably in the chilly temperatures and diverse terrain of Central Oregon. 57 percent reduction in fuel costs. Current 2014 price per gallon for propane autogas is $31 versus $3.11 for diesel. About 169,000 pounds of carbon dioxide eliminated from Bend-La Pine Schools’ carbon footprint, during the lifetime of each bus. 40 percent of total bus fleet runs on propane autogas. 145,000 gallons of diesel displaced per year by switching to propane autogas. The school district ordered 21 propane autogas fueled buses in its initial purchase. Since then, they added four more one year later and 32 Blue Bird Propane Vision Type C school buses for the 2014-2015 school year. Cold weather is not an operational barrier to the use of autogas. Voiles reports that Bend-La Pine’s autogas bus fleet averages 95 percent reliability. By comparison, their newest diesel buses run at 60 to 65 percent reliability. With the ROUSH CleanTech fuel system, the propane remains in a liquid state until it gets to the cylinder. This has alleviated cold start issues associated with vapor technology propane systems of the past. Throughout North America, the fuel system provides unaided cold weather starts to -40 degrees Fahrenheit. The school district saw immediate cost reduction in the price of fuel with propane autogas versus diesel. Currently, Bend-La Pine Schools pays $1.31 per gallon for autogas and $3.11 for diesel. “We are saving thousands of dollars a year using autogas compared to diesel fuel,” said Voiles. Historically, autogas costs about 50 percent less than diesel. 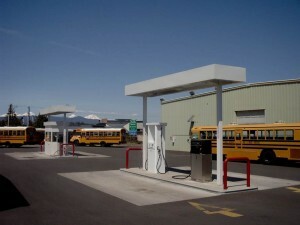 Along with the cheaper cost of the fuel, the school district defrayed some of the costs of the initial fueling infrastructure and bus purchase with the Business Energy Tax Credit from the State of Oregon. While propane infrastructure is the least expensive of all alternative fuels, it obtained funding from the Oregon Department of Education, which reimburses all school district’s transportation operational expenses by 70 percent. Add additional cost savings in reduced maintenance expenses and less staffing needs. The school district has been “pleasantly surprised” that the buses need less service, due to the clean-operating properties of autogas. Although the bus fleet has increased, fewer technicians are required to service them. For the first three years of operation, Bend-La Pine Schools received a $.50 per gallon federal tax credit for autogas, which has since expired. Nontoxic, non-carcinogenic propane autogas is an approved alternative fuel under the Clean Air Act. When compared to conventional diesel, school buses fueled by autogas will emit less greenhouse gases, reduce total hydrocarbons emissions by 80 percent and virtually eliminate particulate matter. It is estimated that each bus in the school district’s autogas fleet will emit 169,000 fewer pounds of carbon dioxide into the atmosphere over the lifetime of the vehicle. Fewer emissions leaving the tailpipe mean less exposure to potentially harmful particulates. Community members have also seen a difference. The school district has heard from parents about the “lack of a dust cloud” at the bus stops and their preference for this fuel. At their La Pine yard, they installed a 2,000-gallon aboveground tank and single dispenser, which can fuel one bus at a time. Western Bus Sales, the local Blue Bird dealer, trained the school system’s technicians on the fuel systems. According to Voiles, their school bus drivers have easily transitioned to autogas, also. “As with any new technology, our drivers were a bit apprehensive to change,” said Voiles. “But after driving the buses, they love them.” The drivers appreciate the power behind the buses and how quickly they warm up. Since implementing clean-operating propane autogas buses, the Bend-La Pine transportation department has hosted numerous training sessions at its facilities. Western Bus Sales refers other school districts to them to answer questions regarding first-hand experience with autogas. “By implementing autogas buses into our fleet, Bend-La Pine Schools has become more sustainable for our community and our children, and an environmental champion in Oregon,” said Blake. 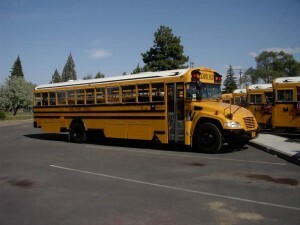 Bend-La Pine Schools plans to continue to increase its autogas bus fleet to 100 buses. About ROUSH CleanTech: ROUSH CleanTech, an industry leader of alternative fuel vehicle technology, is a division of ROUSH Enterprises based in Livonia, Michigan. ROUSH CleanTech designs, engineers, manufactures and installs propane autogas fuel system technology for light- and medium-duty Ford commercial vehicles, and Type A and Type C Blue Bird school buses. As a Ford QVM-certified alternative fuel vehicle manufacturer, ROUSH CleanTech delivers economical, clean and domestically produced fueling options for fleets across North America. Learn more at ROUSHcleantech.com or by calling 800.59.ROUSH.